A homeless man was ordered at knifepoint to steal a charity box from a shop in Sheffield, a court heard. Sean Fletcher, of no fixed abode, admitted taking the Macmillan Cancer Support collection box, containing an estimated £10 in donations, from Patriot Games in the city centre on February 22 this year. The 32-year-old also pleaded guilty to two other thefts, both at a branch of Costa Coffee, from where he stole the contents of a tip jar on two occasions on February 14 and March 8. 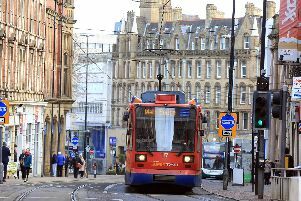 Sheffield Magistrates' Court heard yesterday how he claimed to have been ordered to carry out all three offences by a fellow resident at the Salvation Army building in the city centre, where he was staying at the time. Mr Peart added that Fletcher claimed to have been similarly threatened on both the other occasions, the second time having a knife held to his throat, and had handed over the proceeds every time. Asked why he had not gone to the police, Mr Peart said, Fletcher claimed he had been too scared to do so as he feared for his life. Mr Peart added that the defendant, who had 11 previous convictions, mostly for shoplifting, had expressed remorse for taking the charity box - especially given he had a relative who had been diagnosed with cancer. He said Fletcher had been off drugs at the time but had recently started taking cocaine again, funding his habit by begging. Sarah Brown, defending Fletcher, said he was a ‘vulnerable’ person who showed clear remorse, even claiming to have visited the shops since to apologise for his crimes. Fletcher, who let out a whoop as he left the dock, was sentenced to a 12-month community order including nine months of drug rehabilitation. He was also told to pay an £85 victim surcharge.